Added on June 13, 2013 by Daniel Kuney. When it comes to creating documents and spreadsheets my go to choice is Apple’s iWork collection of applications. Compared to Microsoft’s Office, it’s just easier to use and to create great looking documents. I often write long contracts in Pages and it’s a breeze to manage my numbered bullet points (something that always seems to get messed up in Word). And I love the blank canvas format of Numbers, which allows me to place tables onto my page as needed, giving me much more flexibility than Excel. But in the age of Google Docs, where I can share documents with co-workers and edit them simultaneously, iWork has begun to creak with age. We want our documents everywhere, and, in office settings, we want to work on them in tandem with our co-workers. 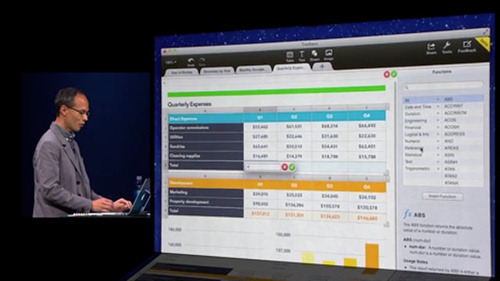 For years, both Office and iWork have relied on local software (eg. Excel, Numbers, Word running on our own computers) to interact with documents also stored locally on our hard drives. Google Docs took the entirely opposite approach by giving us cloud software that interfaced with documents also stored on the cloud. Both philosophies (local + local and server + server) have their pluses and minuses. iWork for iCloud, Apple’s new web based iWork offering, seems to be taking the Google Docs approach by giving us cloud based software to interface with iWork documents also stored in the cloud. But I think this is a really big missed opportunity from Apple. Apple has long maintained that software stored locally is better than software stored in the cloud. And they’re right. It’s why we all love apps on our iPhones. Take the NYTimes app on the iPhone for instance. The app, stored locally on our iPhones, pulls in data from the NYTimes website and delivers an optimized experience that is preferable to actually going to the NYTimes website. It’s local software working in tandem with cloud data in a way that utilizes the best of both mediums. I think Apple could have taken the same approach with iWork. While cloud based software is getting better, it still can’t match the power and responsiveness of desktop software. Instead of devoting resources to developing cloud versions of their iWork programs, they should have enhanced the desktop versions to work with documents stored in the cloud and to enable simultaneous multi-user collaboration. I also think Apple’s current approach to offer both iWork for iCloud through the browser, and maintain desktop and mobile applications of iWork, is bound to cause confusion about where any given document actually lives. You’ll have to ask yourself whether you edited a particular document last on the cloud or locally and then open up the corresponding version of iWork. A local iWork talking to cloud files would eliminate this confusion since there wouldn’t be different versions, just one master file living in the cloud. Perhaps iWork for iCloud will be more of a breakthrough than I’m giving Apple credit for. But it just seems like they are introducing more problems than they are solving by taking this approach. At Monday’s WWDC, Apple showed off preview versions of it’s new Mac operating system, codenamed OS X Mavericks, and it’s new phone operating system, iOS 7. The above article is the first in a series of short posts on some of the new features included in Mavericks and iOS 7.